I have the HP Deskjet F 370 printer which I purchased in 2005, in India. I've forgotten the ink cartridge number for the HP Deskjet F370. Please tell me which black and colour cartridges I can use? Because your Deskjet F370 printer was purchased in India it won't accept the cartridges we sell and the cartridge numbers you'll require will be different to the ones we supply. Like DVDs, printer cartridges are region specific so you must use the correct cartridge number for the region in which the printer was purchased. We list the HP 21 / 21XL black ink cartridges and the HP 22 / 22XL tri-colour cartridges as being compatible with the HP Deskjet F370 but you need to contact HP to find out which cartridge numbers are used for a Dekjet F370 printer that was purchased in India. The HP F370 is a great printer for those everyday printing jobs. Undoubtedly your HP F370 will use all of your printer ink, and when that happens you'll quickly find that ordering HP F370 ink may be very expensive. However, you do not need to fret about dishing out the steep purchase prices you'll see on the high street because right here at Cartridge Save you can purchase all the HP F 370 cartridges you want at super low prices. Save a lot of money on your ink by ordering with Cartridge Save! You don't need to fork over for the F-370 original cartridge or F370 compatible ink on the main street when it's simple to save a ton of money ordering with Cartridge Save. You enjoy complete peace of mind when purchasing DeskJet F370 ink cartridges from us as each one is underwritten by a no quibble money back guarantee. Be mindful of the fact that every purchase also has free delivery, normally delivered to your doorstep the next working day! The HP Deskjet F370 can be a great solution for households or small offices looking for a basic machine that can print, scan, and copy everyday documents. An excellent entry level device, the F370 can print high resolution photos of up to 4800x1200dpi, and scans at about the same rate. The machine is built for low-volume usage, so it is not suitable for larger scale businesses. It only supports wired connectivity and cannot be networked. The HP Deskjet F370 looks very much like its F300 brothers. It comes in a white and grey shell, and features a pull down extendible paper tray right in front plus a flat bed scanner on top. It features controls for cancelling prints, as well as for starting copies and scans on top of the main power button. The HP Deskjet F370 has a USB port at the rear, beside which is the power connection. The PictBridge port allows direct-from-camera printing. 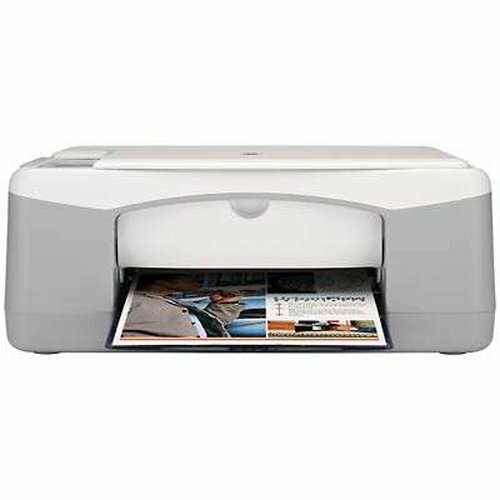 The HP Deskjet F370 produces good quality photos with realistic hues and fantastic details. It boasts decent print speeds and also scores high in terms of quality of text and graphics. The copier can enlarge documents up to 400%. One of the downsides of the HP Deskjet F370 is its low monthly page yield, which at 700 pages, cannot compete with high-yield MFPs. Its ink tanks aren't cost-effective, producing only 190 black and white pages and up to 165 colour pages on average.